The first smile is a milestone that can warm your heart. After many long and often sleep-deprived nights, suddenly your baby turns to you and grins. But a baby’s smile is so much more—it has an important role in his or her lifelong health. Baby teeth are vital for chewing foods and speech. They prepare the mouth and jaw for permanent teeth as well. Tooth decay is one of the most common chronic diseases among children today—the Centers for Disease Control and Prevention reports that about 1 in 5 kids ages 5 to 11 have untreated tooth decay. Yet we know that proper oral health early in a child’s life can also reduce problems later on. Clean your baby’s mouth after feedings—even before the first teeth come in. Wipe the gums with a soft, clean cloth. Once baby’s teeth come in, brush them with a small amount of fluoride toothpaste on a small, soft-bristled brush. 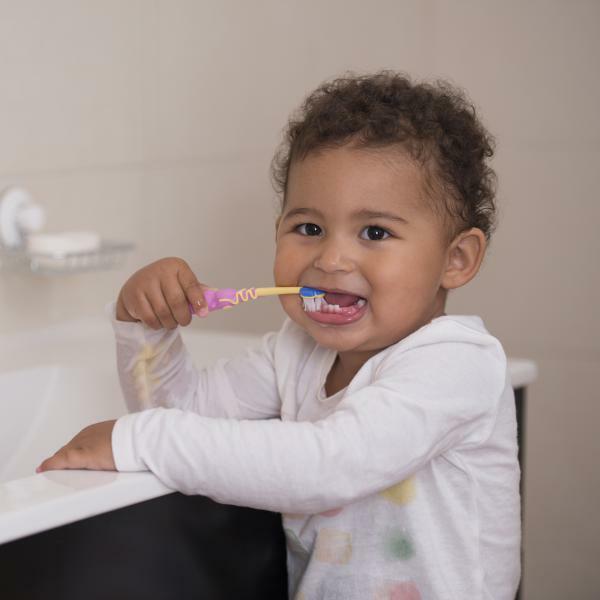 All children should be brushing teeth for two minutes, two times per day. Don’t put babies to sleep with bottles of formula or sugary drinks, as this can lead to tooth decay. Wait until baby is 1 year old before serving juice. For more information about children’s oral health, visit http://2min2x.org/.